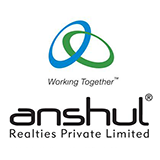 Anshul Group has broadened the horizons of Pune's real estate industry through its new architectural creations. The group is not just one of those random real estate builders and developers in Pune, but an iconic epitome among the remarkable builders and developers in Pune. Our identity lies in our name as well as in the impeccable living standards offered to the genus through quality, creativity and integrity. Being counted as one of the most liable and prestigious real estate developers in Pune, Our designs are an outcome of immense hard work, dedication and customer oriented perceptions. Our stronger foundation of working philosophy and team-work is known for setting up new benchmarks among the builders and developers in Pune. The endeavor was initiated with an approach of making it into the list of top most builders and developers in Pune. Anshul Realties is recognized for its exceptional integrity, highest quality promise and consistent customer support. Our pre-defined process and proven track record of delivering excellent quality projects ensure complete customer satisfaction. With our signature projects which have now become benchmarks for upcoming real estate companies, we take pride in being one of the trusted entities in the area of real estate and construction of residential and commercial projects.